Mountaineer Boukreev (The Climb, 1997), who died in an avalanche on Annapurna in 1997, gives a glimpse of his heart-pounding expeditions in this unadorned collection of his climbing journals and occasional articles. 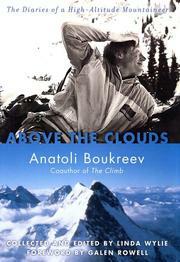 Boukreev was a fixture in the Himalayas during the 1990s. He climbed the toughest peaks by difficult routes, often with almost no oxygen and always on a shoestring. He developed a reputation for brashness and unpredictability—he did things his way and didn't give a hoot what others thought about it—and an aloofness that was more a product of his difficulty with languages other than Russian. The writings gathered here are post-climb ruminations and chronicles: how the expeditions worked, who impressed him with climbing abilities, how he felt things should have been done differently. If there is one uniform sentiment these pieces convey, it’s that Boukreev was always thinking. For instance, how his body was adjusting to the altitude: “My rate of ascent inspired confidence. Given my body’s ability to perform, I determined that I would have the strength necessary for the descent.” He hated to turn back before reaching his goal and he took risks—mountaineering is all about risks—and a good number of his companions died: “It is easy to lose in the mountains if you step over the border of what is possible. Where are those borders?” Surely they were close by that fateful night on Everest in 1996 when he single-handedly dove time and again into a raging storm to rescue climbers lost in their descent, rescues that are sharply captured in these pages. So, too, are elements of his climbing philosophy—how to become physically prepared, and then how to be spiritually available to the mountain’s magic—that complete this rough portrait.